It's a challenge to sketch on such a day. I was feeling a frustrated until I saw what others had accomplished. 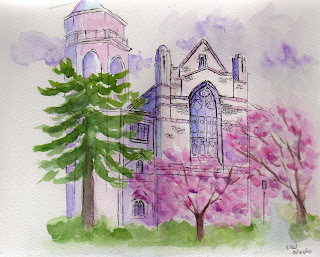 There were some wonderful images of the campus buildings and the gentle abundance of those trees in the quad. I found a cherry blossom stuck to my palette.. This is a sketch of the smaller trees near the library - some color added when I got home. Absolutely lovely use of color. I agree! Both rich and ethereal.